AI shouldn’t stop at reaching the human level it must go beyond the capabilities of humans for it to reach its peak potential. To be franker there are too many definitions some common of them are as follows. Is the simulation of human intelligence processes by machines, especially computer systems. These processes include learning, reasoning, and self-correction. AI can be classified in any number of ways there are two types of main classification. Weak AI or Narrow AI: It is focused on one narrow task, the phenomenon that machines which are not too intelligent to do their own work can be built in such a way that they seem smart. An example would be a poker game where a machine beats human where in which all rules and moves are fed into the machine. Here each and every possible scenario need to be entered beforehand manually. Each and every weak AI will contribute to the building of strong AI. Strong AI: The machines that can actually think and perform tasks on its own just like a human being. There are no proper existing examples for this but some industry leaders are very keen on getting close to build a strong AI which has resulted in rapid progress. Reactive Machines: This is one of the basic forms of AI. It doesn’t have past memory and cannot use past information to information for the future actions. Example:- IBM chess program that beat Garry Kasparov in the 1990s. Limited Memory: AI systems can use past experiences to inform future decisions. Some of the decision-making functions in self-driving cars have been designed this way. Observations used to inform actions happening in the not so distant future, such as a car that has changed lanes. These observations are not stored permanently and also Apple’s Chatbot Siri. Theory of Mind: This type of AI should be able to understand people’s emotion, belief, thoughts, expectations and be able to interact socially Even though a lot of improvements are there in this field this kind of AI is not complete yet. Self-awareness: An AI that has it’s own conscious, super intelligent, self-awareness and sentient (In simple words a complete human being). Of course, this kind of bot also doesn’t exist and if achieved it will be one of the milestones in the field of AI. 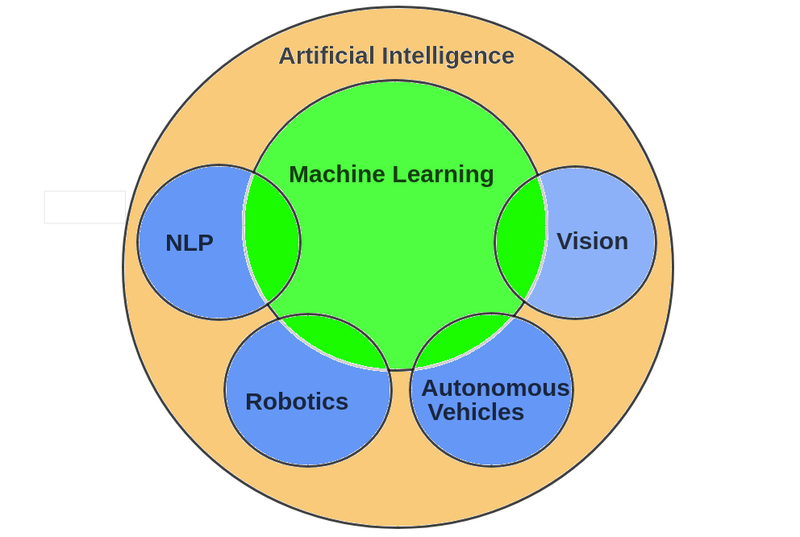 Machine Learning (ML): It is a method where the target(goal) is defined and the steps to reach that target is learned by the machine itself by training(gaining experience).For example to identify a simple object such as an apple or orange. The target is achieved not by explicitly specifying the details about it and coding it but it is just as we teach a child by showing multiple different pictures of it and therefore allowing the machine to define the steps to identify it like an apple or an orange. 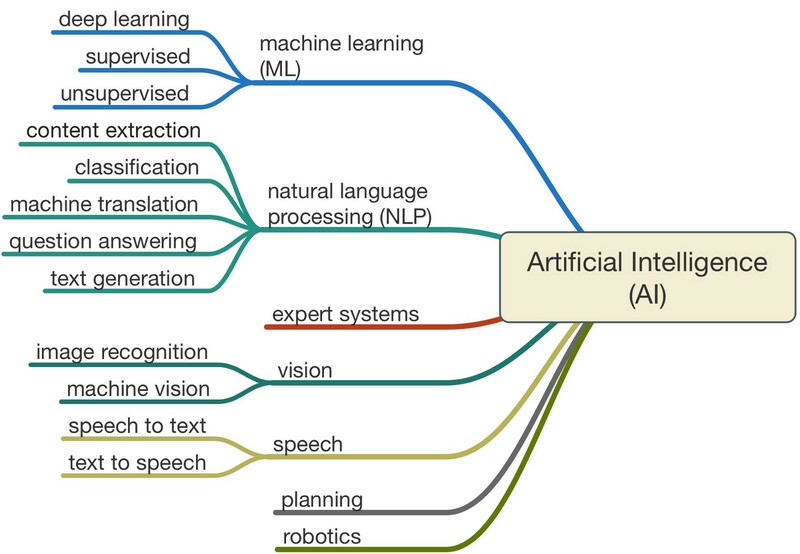 Natural Language Processing (NLP): Natural Language Processing is broadly defined as the automatic manipulation of natural language, like speech and text, by software. One of the well-known examples of this is email spam detection as we can see how it has improved in our mail system. Vision: It can be said as a field which enables the machines to see. Machine vision captures and analyses visual information using a camera, analog-to-digital conversion, and digital signal processing. It can be compared to human eyesight but it is not bound by the human limitation which can enable it to see through walls(now that would be interesting if we can have implants that can make us see through the wall). It is usually achieved through machine learning to get the best possible results so we could say that these two fields are interlinked. Autonomous Vehicles: This area of AI has gathered a lot of attention. the list of vehicles includes cars, buses, trucks, trains, ships, submarines, and autopilot flying drones etc. The fields above in simple terms can be shown as below and we can see why machine learning plays a major role in achieving AI. Next I have Artificial Intelligence vs Machine Learning coming up make sure to follow me on medium, linkedin, twitter,Instagram to get more updates.